Specialty Anhydrides | Broadview Technologies, Inc.
Broadview ‘s anhydrides offer numerous advantages over other epoxy curing agents. In addition to being cost effective, anhydrides offer strength, thermal stability, low toxicity and non-critical mix ratios. They have low shrinkage upon cure and maintain excellent electrical properties. Versatility is another benefit of our anhydrides. Castings and reinforced structures can be manufactured with superior physical properties coupled with Tg’s up to 275° C. In addition, they can be used to manufacture flexible films that can withstand continuous exposure to 230°C. The long pot life and low viscosity of anhydride cured epoxies facilitate ease of work, making them ideally suited for electrical, composites and filament winding applications. Epoxy resins cured with anhydrides can be fully cured at temperatures as low as 70° C. Alternatively, such systems can be accelerated to cure within minutes at 150° C for pultrusion and resin transfer molding. 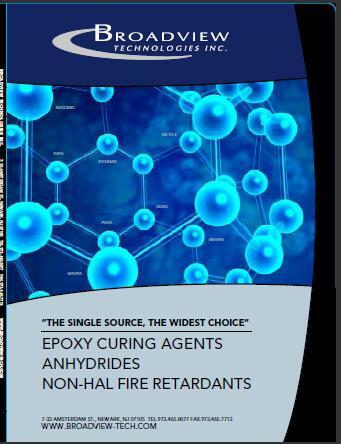 With over a dozen different anhydrides available for the curing of epoxy resins, we offer the greatest variety of anhydrides and anhydride systems to solve your problems. We are committed to the safe handling and use of our environmentally safe, low toxicity anhydrides. The anhydrides offered include fully hydrogenated cyclo-aliphatic and aliphatic anhydrides for UV stability, as well as liquid anhydrides for composite manufacture and electrical casting. In addition, Broadview offers polymeric anhydrides for improved thermal cycling and impact resistance. Broadview also manufactures pre-catalized and formulated anhydrides. New to Broadview’s line are a 70°C curing, low viscosity resin infusion system and a two-phase toughened anhydride system that maintains a high HDT. Unsaturated liquid anhydrides are the workhorses of epoxy filament winding, pultrusion, resin infusion, and electrical potting. Offering superior performance, low cost and low viscosity, unsaturated liquid anhydrides have excellent electrical properties as demonstrated in their use in the potting and encapsulation of ignition coils, high voltage transformers, printed circuit boards, etc. These anhydrides are unequaled in their cure versatility and overall value proposition for filament winding and resin infusion. When moisture resistance, UV stability and crisp, clean, color and color retention are needed, saturated liquid anhydrides are the answer. These anhydrides are used in L.E.D. displays, clear coats, and insulators for outdoor electrical transmission equipment. Our polyanhydrides offer excellent thermal shock resistance even after high temperature heat aging. They provide noise dampening benefits with a rubber-like durability. Polyanhydrides are typically used for the manufacture of flexible PC boards and films, and the potting and encapsulation of high performance electrical coils. Where flexibility and toughness are required, polyanhydrides are the most efficient answer.